O’Reilly is offering a free webcast on Expanding the Capabilities of your Arduino Projects. 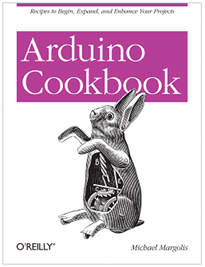 The one hour presentation is scheduled for Tuesday, June 19, 2012 at 10 AM PT and features Michael Margolis, author of the Arduino Cookbook, 2nd Edition. For more information or to register visit O’Reilly’s webcast registration page. This entry was posted on Saturday, June 16th, 2012 at 3:00 pm	and is filed under Arduino, talks. You can follow any responses to this entry through the RSS 2.0 feed. You can skip to the end and leave a response. Pinging is currently not allowed. Is there a way to get these O’Reilly Webcasts after they have been broadcast? Quite often these are times which make it impractical to watch. Did you Register for the Webcast? Maybe if you register, even if the Webcast live-time has passed, there may be a way to view it after the fact. I don’t want to register. O’Reilly is about monetizing open-source, which I have no problem with. But when O’Reilly says this Webcast is “Free”, they then collect a lot of personal information – which is ANYTHING BUT FREE!! I would think they would allow linking to the recorded Webcast without this personal information harvesting burden in order to promote the purchase of the related book. Or – maybe I’m missing something?